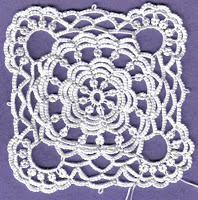 While surfing the other day I saw picture of a corner of a crocheted bit that had a fairly solid circular motif with lacier bits making square corners and I thought of doing something like it in tatting. I got the circle part done and stared on the lacy part, but it didn't work so I un-did an entire row. I liked the rings in the corner and added a row to join them all together. I'm not sure if I want to add another row of chain or just stop here. I made a mistake I'll have to correct, but it's at the beginning of the prvious row. I'll either have to cut off 2 rows or cut out part of the previous row. Or not, I'm not planning on doing anything with it, I was just playing around. Sharon, this is just lovely. Do you know how a design just calls out to you sometimes? I already was reminded of crochet bedspread squares even before I read the description.